Everyone's favorite! 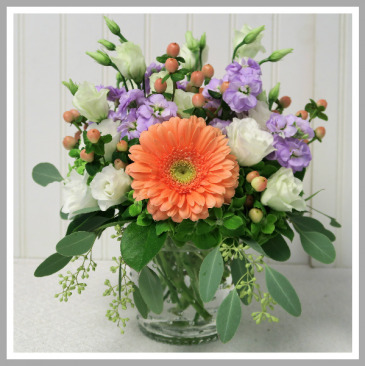 Peach gerbera, lavender stock, white lisianthus and peach hypericum berry are nestled in with emerald green hydrangea. Accented with seeded eucalyptus in a hobnail glass vase. 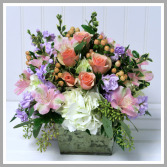 Beautiful pink lilies, cymbidium orchids,roses, hydrangea , hypericum berries and spray carnations in a clay pot. Soft and sweet! 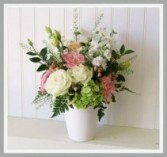 Cottage Chic arrangement is sure to bring smiles. Our cottage inspired vintage tin is lushly filled with white hydrangea, spray roses, alstromeria, fragrant spray stock and accented with seeded eucalyptus and pepper grass. These soft and soothing colors are suitable for all occasions. Mondial roses, green hydrangea, white spray stock, peach hypericum and pink lisianthus compliment this white contemporary ceramic vase.